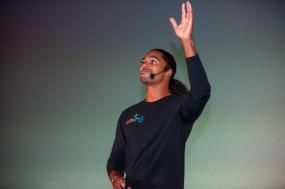 ROAD TOWN, Tortola, VI - Virgin Islander, Chad Lettsome was named the best start-up in the second edition of Present Your Startup Caribbean in Curaçao last month. Mr Lettsome’s start-up business, Ching, presents a FinTech solution for the Caribbean which helps small entrepreneurs with an app that scans credit cards and makes it possible for the user to pay with a signature. The announcement was made on September 10, 2018 which said Premier and Minister of Finance, Dr the Honourable D. Orlando Smith, OBE congratulated Mr Lettsome on his achievement. Mr Lettsome has also secured a spot in the finals of Present Your Startup the Netherlands, which will be held in Haarlem, Netherlands on November 28. Premier Smith also congratulated Lenette Lewis of Sageroots for a job well done. 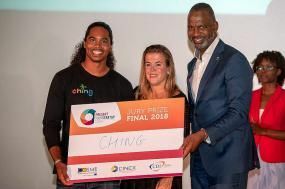 Ms Lewis competed in the Present Your Startup Caribbean Finals as one of the five finalists alongside Mr Lettsome and other competitors from Bonaire and Curaçao. Mr Lettsome also won NAf 10,000 and announced his partnership with CX Pay from Curaçao to expand his product to Curaçao. Currently, Ching is being used in the Virgin Islands and Jamaica. Premier Smith also acknowledged COSME, a European Union funded programme for its role in providing Mr Lettsome and Ms. Lewis with the opportunity to be a part of the event. COSME partnered with Present Your Start Up (PYS) in Curacao subsidising entrepreneur entrance fees and training expertise for 15 panel selected businesses. This Startup Academy delivered the opportunity for selected entrepreneurs to accelerate their business growth through coaching, one-on-one training and access to finance through the onsite investor network. There were 40 entrepreneur submissions from which 15 entrepreneurs were selected based on a 5 Key Selection criteria including: Innovative, Scalable, Market Potential, Impact and Team. Eight of the selected 15 entrepreneurs were from the Caribbean Overseas Countries and Territories (OCTS) that COSME actively supports through the European Union funding to develop sustainable, competitive businesses in that region. Way to go Chad!!! Congratulations! I know his parents are so proud of him. Congratulations Chad.